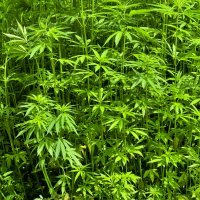 A long-established cannabis eradication program that seems to have focused on non-intoxicating industrial hemp may soon be in its death throes, or at least be very much trimmed down. The US Drug Enforcement Administration initiated the Domestic Cannabis Eradication/Suppression Program (DCE/SP) in 1979 and it was adopted by all states by 1985. It’s an expensive program, costing approximately USD $18 million last year. In 2014, the DCE/SP claims to have been responsible for the eradication of 3,904,213 “cultivated outdoor cannabis plants”. However, it appears many of these plants were “ditch weed” – feral cannabis plants with very low THC levels – in other words, industrial hemp. Hemp was once commonly grown on a commercial scale in the USA until the 1950’s when it was outlawed. The “ditch weed” industrial hemp plants of today are descendants of those crops. The plant earned the nickname “ditch weed” given it is a common sight in roadside drains in some parts of the USA. A dozen Members of Congress recently penned a letter recommending funding for the Domestic Cannabis Eradication/Suppression Program program to be cut. Among their reasons is the fact an increasing number of US states are now dumping marijuana prohibition laws. However, their major concern is great expense has been incurred in destroying what are essential harmless plants. The letter states seizure of these plants is not economic and has no public safety or health-related benefits. “Its sole impact has been to expend limited federal resources that are better spent elsewhere”. After decades of industrial hemp being associated with its intoxicating cousin, it seems sanity is finally starting to prevail in countries where it has been unjustly banned. This will be to the benefit of all; as industrial hemp has thousands of uses – and it can be grown more economically and in a more environmentally friendly way than the crops it can replace.